Too crazy not to share! Gives a new meaning to “ammo dump”. “Benno” the Belgian Malinois has eaten enough strange objects over the course of his four years, you’d think his digestive tract is bulletproof. As it turns out, that’s not quite the case. His owner had to take the dog to the vet’s office after Benno ate 23 live rounds of .308 caliber ammunition. And when we say ate, we mean chewed vigorously to the point of mangling the ammo, then swallowing each round. Benno eating something inappropriate is not unusual, according to his owner Larry ‘Sonny’ Brassfield of Mountain Home. The night before, Brassfield was putting several hundreds of ammo into ammo cans. He did not have enough room for the last 200 or so rounds of ammo. Brassfield had no idea exactly how much ammo the omnivorous dog had eaten, but he was about to find out. Sexton says she was surprised by the x-rays. An x-ray reveals 17 live .308 caliber rounds in the stomach of “Benno”, a 4-year-old Belgian Malinois. The dog, who ate a total of 23 live rounds, is recovering after a successful surgery to remove most of the ammo. Sexton asked Brassfield what the ammo was made of. 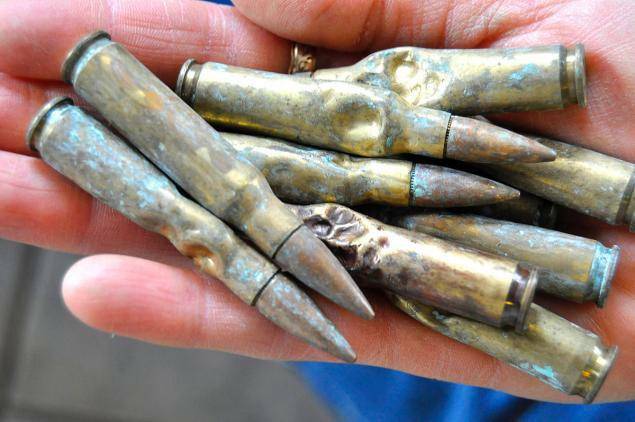 Lead and zinc, two metals used in ammo manufacturing, can quickly be toxic for dogs. To everyone’s relief, Brassfield told Sexton the ammo was made from brass and copper. Sexton operated on Benno and during a procedure that lasted approximately two hours, she removed 16 live, highly chewed rounds and one shell from the dog’s stomach. Once she removed the ammo from the dog, Sexton had Benno x-rayed once more, just to be sure she got all the ammo. Two x-rays were needed to cover the digestive track of the large dog. That’s when Sexton saw two more rounds in the dog’s esophagus. The vet made the decision not to open Benno up again to remove the last two rounds. The surgery itself went fine and Benno is expected to make a full recovery. Sure enough, Benno passed one round five days after his ammunition buffet. Benno ‘shot’ the final round on Thursday, some eight days after his high-caliber snack.